Almost every Friday night for the past 10 years or so, I've been a volunteer with a writing program called The Beat Within. Each week, I join staff and other volunteers at the juvenile hall in my home town to hold writing workshops with kids, ages 14-18. The hand-written pieces from the workshops are then published into a weekly magazine, The Beat Within, which circulates through juvenile halls and prisons around the country. Each entry is published along with an adult response. It's an amazing program. And now, I'm helping to raise funds to keep it going. We're asking authors to donate autographed copies of their books to give away as a thank-you gifts to donors. The drive is just getting started and already so many wonderful writers have stepped up, including from Newbery-award winner Paul Fleischman and Karen Joy Fowler, author of the bestseller The Jane Austen Book Club. To read all the details about the fundraiser, click here. We need your help if you are an author, or if you love books and kids! For more info, contact me here or at Books4Beat@gmail.com. And please, please feel free to pass along this message and post it on Facebook, your blog, etc. I met Jillian Cantor when we were both on the same panel at the Tucson Book Festival. The joke was that, in order to be a YA author, you need thick dark hair, to be named Jill and to have grown up in Philadelphia. Jillian is the author of the wonderful YA novels, THE SEPTEMBER SISTERS (Harperteen) and THE LIFE OF GLASS (Winter 2010/Harperteen). Her first novel for adults, THE TRANSFORMATION OF THINGS, will be released in Fall 2010 by Avon/HarperCollins. I'm so glad that she didn't toss her high school journal. In my upcoming release, THE LIFE OF GLASS, my main character Melissa keeps a journal during her freshman year in high school. It is a continuation of one her fath er kept before he died, a journal filled with strange facts and unusual love stories, a journal Melissa adds to by writing in the love stories she knows and discovers throughout the year, just so they won’t be lost. Here are some excerpts from some of the entries. All the names are totally changed because. . . well, because I’m actually Facebook friends with most of these guys now, and even all these years later I would be mortified if any of them read this and realized I was talking about them! Sorry I haven’t written in awhile. . .as for A. I wish he would ask me out, so I could say NO! Yuck!! . . .B is so funny, he makes me laugh all the time. He’s just a really awesome person. Well, long time no see. B. is SO long gone. I thought that I liked C., but then on Friday we had a dance, and suddenly I found D. very attractive. . . Options for the Dinner Dance are still open. Who knows? Anything could happen between now and June 11. I really like D. I want to go to the Dinner Dance with him, but I’m scared to ask him. What if he says no? What if he says yes? Then there is a whole saga involving the Dinner Dance, in which one guy (E.), who I only liked as a friend, asked me and I said yes. But then this other guy (F.) who I dated on and off in junior high confessed his love for me and asked me, so I backed out on my yes with E. and ended up going with F. instead. I still cringe just thinking about it now. The rest of the journal pretty much chronicles my relationship with F., which really wasn’t much more than a friendship. We never even kissed – a point I obsess over for pages and pages. And then the journal ends on September 3, 1993, which was the first day of my sophomore year and also the day I met my first serious boyfriend (who is now my husband). And after that, I never kept a journal again. Although, part of me almost wishes I’d kept writing, because that’s something I’d love to read now, what I was thinking and feeling when I first started dating my husband, what I would’ve written about him. And then the other part of me is REALLY glad I didn’t! Every time I talk to a group of students, I inevitably get asked the same question by an earnest and passionate tween or teen: "I'm a writer. Where can I get published?" For writers 13 and under, there's the wonderful Stone Soup, which is published in my town (Santa Cruz, CA), and distributed all over the country. It's been described as "The New Yorker for kids", and I agree. For details on how to publish and subscribe, go to stonesoup.com. At this website, you'll find more resources. Click on "links" and click on "Young writers in print." Voila. A wonderful salesperson at Anderson's Books in Naperville, Ill. suggested kidpub.com and its teen counterpart at teen-author.com. A friend pointed me to teenlink.com. Another: Kids who are immigrants or whose families are immigrants might enjoy entering Mitali Perkins' Fire Escape contests. Now it's your turn. Have your found anything else either print or online? Each week, Julie Halpern features an author on her Blog of Wonder: Proust Questionnaire. Today's guest? Me. Lots of fun to answer the questions. Check it out here. 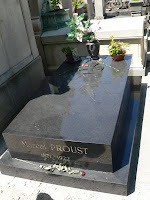 Couldn't resist posting the picture of Proust's coffin.